You’ve done your homework and decided that it’s time for your company to start integrating Corporate Social Responsibility into your business strategy. Congratulations! But, be careful or you will simply waste time, money and resources. During this exciting time, it can be tempting to jump into action before taking the time to plan. However, in order for your CSR strategies to actually work and align business, social and environmental performance, it’s important that you make a few decisions before taking action. Acting before planning in CSR, as with anything else, can result in costly and unexpected problems. CSR takes investment. It isn’t free. To be successful you need to be ready to invest time, money, reputation and more. And, you need to connect that investment to value. Value for your business, and value for society and environment. You wouldn’t invest business resources in other areas without a connection to value – CSR is no different. CSR investments should produce business value along with social impact and environmental stewardship. By its very nature CSR investments will have a focus on social and/or environmental issues. But it is often quite easy to make the value connection as well. If you don’t go the next step and integrate a business value connection you are wasting time, money and reputation. Even if you succeed in creating the social/environmental value you plan, you will not be successful. You will have squandered resources in areas that don’t produce business value, and will be the first to be cut when times get difficult. When considering where to start you need to identify the social/environmental priorities and determine which of those can integrate and align with your business priorities, issues and opportunities. The same level of strategic planning and accountability that is applied to other areas of your business needs to be applied to CSR initiatives. In a previous blog post, I discussed how CSR is about more than just donating to charity. The value interaction between you and your stakeholders is critical to the success of your organization/business. Developing value propositions that create self-interested links between your stakeholders (customers, regulators, investors, employees, communities, key influencers, etc.) is key to success in all areas – including CSR. Enter your email to recieve notifications whenever we post a new article. 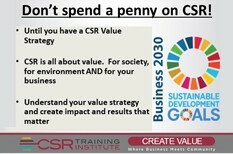 Creating your CSR Value strategy can be a complex or a simple process. We suggest starting out imple. Complexity will overwhelm your initiative if you let it. What’s important is to find the early success and leverage that for more expansive programs. Start with a few colleagues. Use this early stage as an opportunity to educate them on the CSR and how it must connect to value. You and your colleagues have more answers and insight in you than you realize. The process set out below is simple and simplistic, but it will produce insight, results and value. And, working through it together will build team and energy. Do a simple analysis of the value situation in your organization and the current social and economic impact you are having. Use that as a basis for identifying CSR sweet-spots where there is alignment between organizational value, stakeholder value, social value and environmental stewardship. Where are you impacting society and environment now? What is your core value strategy for your business? How do you create shareholder and business value? What are your major pain points? What are the big struggles and challenges your business is dealing with? 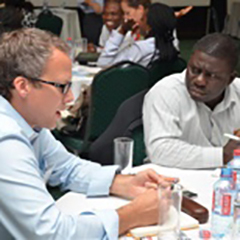 What are the core social & environmental issues for your organization? What are the core value issues for your key stakeholders? (Customers, regulators, communities, investors, partners, employees, etc.)? How do they create organizational value and fulfill their mission and purpose? What are the core social & environmental issues/pain points for your key stakeholders? Analyze the above for alignment, synergy and innovation options where there is the potential to align business value with social and environmental value that is important for your organization and for one or more stakeholders. This may seem daunting, but it isn’t. Get started. Have conversations with colleagues around these questions. Don’t worry about getting it perfect. Just start. Have the first conversation. It will stimulate more and you will be surprised at the outcome. At CSR Training Institute, we understand that the process of introducing Corporate Social Responsibility into your business strategy can be overwhelming. That’s why we are here to help. If you are struggling to move forward, we can work with you to cut through the confusion to align business, social and environmental performance. If you would like to speak to me about how a value-centric strategic approach to CSR can help your business leverage social capital to deliver more value, email me at wayne@csrtraininginstitute.com.